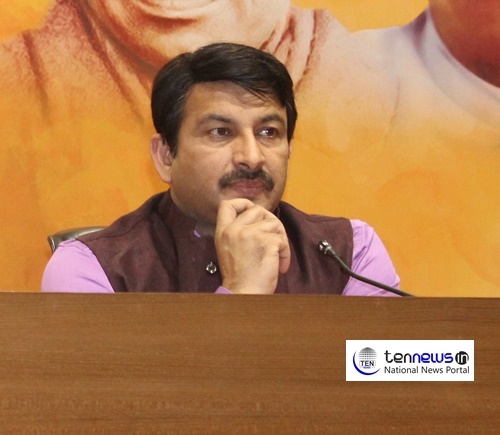 New Delhi: Delhi BJP Chief and MP Manoj Tiwari came down heavily on Aam Aadmi Party (AAP) on Sunday over their conspiracy to spread communal violence during Ram Navami celebration in the national capital. “It did not matter that they are close to Gopal Rai, Sanjay Singh as well as Ram Nivas Goel, the Vidhan Sabha speaker or anyone else but the matter is Nandlal Kanugiya has been appointed on the recommendation of CM Arvind Kerjiwal, which is shameful,” Tiwari added. Recently, Kapil Mishra posted an explosive video claiming that those miscreants who were wearing saffron scarves and waving swords outside the mosque near the residence of Vidhan Sabha speaker Ram Nivas Goel were AAP volunteers. Mishra alleged that this was a conspiracy to foment communal tension between Hindus and Muslims in Delhi. “Now, it has proved that development is no more AAP’s agenda. Now, they are spreading communal tension by defaming BJP,” said Tiwari adding that a proper investigation should be conducted in this matter and the offenders should be punished.